I recently told the staff of Kotaku that I would happily buy each of them a copy of BoxBoy. I like it that much and think it’s that useful for them to play. I’d offer to buy you a copy, too, but that would be ridiculous. BoxBoy is special. It’s a clinic on game design. It’s a game that starts simply, asks little of you and then, soon enough, has taught you moves that would have seemed, minutes ago, like wizardry. The last game that did that so well was Portal. The game, which came out last week on the Nintendo 3DS—and which you can be forgiven for having never heard of since it was a little-heralded, download-only, black and white thing—comes from HAL Laboratory. They’ve been briefly freed, apparently, from cranking out Kirby games and authorized to instead make a black and white side-scrolling game about a box-shaped boy who can sprout a few boxes from his body and use them as platforms, bridges, hooks and more. That up there is an illustration showing some of BoxBoy’s cooler moves. Top left corner: the hook. Top right: the snake. Bottom left: a basic shield. 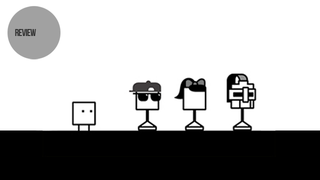 BoxBoy is built on a Mario-meets-Tetris concept that is so simple it’s a wonder no one made this game years earlier. Basically, your little box-person can sprout a box (or two, or more) in any direction, carry it around, climb on it, and creatively use it to overcome obstacles in the game’s many levels. The boxes have to be connected, which means you’re more or less creating Tetris pieces: The L, the S-thing, the line. You’ll use those as steps, bridges and whatnot. Look at that first big image again. Top left corner. The thing I called “the hook.” See how it would’ve worked now? There are more than 15 worlds in BoxBoy, each themed to a new move you’re being taught or a new level gimmick like, say, the aforementioned conveyor belt or cranes. Every world contains several levels, and each level has two different goals: make it to the end, and collect the optional crowns that have been left floating out of reach. 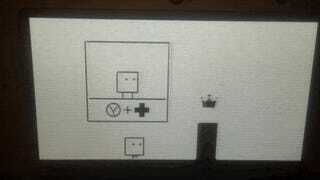 At the start of each level, you find out how many contiguous boxes BoxBoy can sprout from his body (it’s seldom more than four or five) and you’re shown how many he can generate overall before the crowns disappear from the level. I’d like to show you all of the game’s 10th world, one that is all about a special kind of pit. Bail out from watching the clip at any time if you don’t want to see the solutions. Watch the whole thing if you want to see how beautifully the game trains the player to do trickier and trickier things. You’ll see me temporarily get stumped a few times, but you’ll also see me work out the solutions and move ahead. Some people may find BoxBoy a little easy. In most of its main worlds, it is more brain tease than brain torture. Dig enough into the game, though, and you’ll find some very tough bonus levels (and a bunny costume, too). I had encouraged my team to play it, because it feels like a rare thing to play such a well-designed game, to see how a designer toys with a player, teaches a player and finds ways to delight them, one challenge at a time. I recommend the same to you. 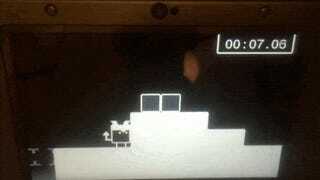 BoxBoy is an extraordinary game.